KUALA LUMPUR: Malayan Flour Mills Bhd (MFM) is more than a flour miller and poultry farmer. It wants to climb the food chain. The group is putting in efforts and investments to establish a solid foothold in the downstream segment of the food industry, including aquafarming. The group has embarked on an ambitious expansion plan laying ground for it to feed the region’s growing appetite for protein-rich food. MFM is investing RM1.1 billion over the next two to three years to build its integrated food complex in Lumut, Perak, where there are existing poultry farms, aquafarms and poultry processing plants. Consequently, the group needs to raise fresh capital to finance the expansion, so that it would add financial stress to the group while raising its game. The group’s primary processing plant has currently reached its bottleneck. Its existing plant is slaughtering about 80,000 birds a day, which is already the maximum capacity, according to its managing director Teh Wee Chye, who is also a substantial shareholder with an 18.23% stake in the group. “One main reason why we want to expand our poultry processing plant is because this is a 30-year-old plant; we have maxed up the capacity a couple years ago, so we can’t slaughter more chickens. If we do not have capacity constraints, we can easily have customers line up for 120,000 birds,” Teh told The Edge Financial Daily in an interview. “As we speak, we have to turn customers away because we cannot slaughter fast enough. Yes, we have the happy problem, but people don’t realise that. It is not a demand issue; it is more of a supply constraint we have that is limiting our growth,” he added. Teh estimated that the domestic poultry market is worth between RM8 billion and RM10 billion. However, the industry is not expanding swift enough due to a lack of investments to meet the growing domestic demand. As a result, the country is importing chicken meat from time to time to feed any spike in demand. “We see opportunities to substitute some of these imports of food and agriculture products,” said Teh. MFM produces about 60 to 70 million chickens a year, of which 50% to 60% of them are sold to the live bird market partly because of capacity constrains. If without capacity constraints, MFM will rather sell less live birds to the middlemen supplying to the wet market. 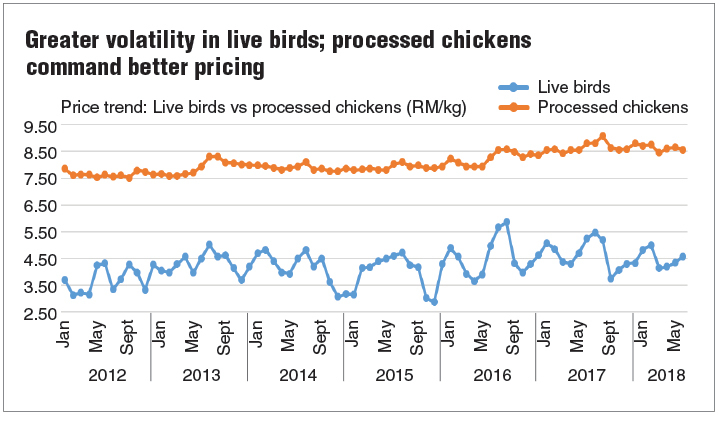 The prices and profit margins of the live bird market are a lot more volatile compared with processed chickens. More importantly, Teh said any additional capacity will help the group go further downstream in the food processing business, such as chicken nuggets or sausages, which offer wider profit margins. To expand capacity, said MFM chief financial officer Cheang Kiat Cheong, the new primary procession plant will cost about RM550 million. On top of that, the group’s aqua feed mill costs up to RM70 million, while jetty expansion will cost up to RM60 million. “We also need to build more farmhouses, which cost about RM1.2 million each for a 19,000-sq ft unit. All these will total about RM1.1 billion. “We are actually fully integrated, but what we want to involve in is to really become a food company that focuses on processing chicken meat, going downstream,” he said. The year 2018 was not a good one for MFM, which slipped into the red for the third financial quarter ended Sept 30, 2018 (3QFY18), posting a net loss of RM5.19 million compared to a net profit of RM23.51 million a year ago. For the nine-month period ended Sept 30, 2018, its net profit plunged 98.2% to RM1.18 million from RM64.57 million a year ago, although its revenue dropped by a marginal 3.1% to RM1.75 billion. MFM’s annual earnings for FY18 are likely to be the lowest since FY15, when it posted a net profit of RM20.55 million. One reason for its dismal performance was a fluctuation in live bird prices. Furthermore, its Indonesian flour mill suffered from a weak rupiah, which depreciated to an almost-20-year low against the US dollar. “In September last year, the rupiah fell to as low as 15,400 to the US dollar, which was worse than [during] the 1998 financial crisis; 80% to 85% of our flour milling business cost is in US dollars for wheat,” Cheang explained. “We cannot pass on the cost to consumers because the biggest player [in Indonesia], which has a 50% market share, refuses to increase prices to protect its market share. [As such, for] the first nine months of 2018 [our] Indonesian [operations] were not making money because while cost went up, our prices [did not],” he added. Revenue from MFM’s Indonesian joint ventures was equivalent to 41% or RM994.54 million of the group’s total revenue of RM2.4 billion for FY17. Nonetheless, Cheang pointed out that things have been improving since the fourth quarter of 2018. “The exchange rate [of the rupiah] over the past couple of months has been coming down against the US dollar, and flour prices [have] also [seen] a slight price increase as nobody can take it [any longer]. Everyone is losing money,” he said. Additionally, Cheang also said live bird prices have been increasing after September last year, hence management is optimistic about MFM’s upcoming financial performance for 4QFY18. Teh is confident that FY19 will be a better year considering the new capacity coming on stream. The second phase of the primary processing plant will ramp up MFM’s daily capacity to slaughter 240,000 birds compared with 80,000 currently. The group is also building a new aquaculture feed mill, which will be commissioned by next month, as well as a jetty catering to a Panamax vessel. The jetty will be up and ready by June this year to facilitate the import of wheat for its flour milling operations. Should things pan out as planned, MFM’s prospects seem promising. The group will not be just a leading flour miller in Asean (the largest in Vietnam and the fifth in Indonesia); it will be a food company that supplies processed chicken products and fish as well.